You can configure user's Connection Limitation and Data Transfer Limitation here. Specifies the maximum number of concurrent sessions that may be opened from a single user account. Specifies the maximum number of concurrent sessions that a user may open from a single IP address. When a client has been idle for a specific time, it will be automatically disconnected. Limits the maximum download bandwidth for each individual session. Setting a limit of 0 KB/s means unlimited bandwidth. 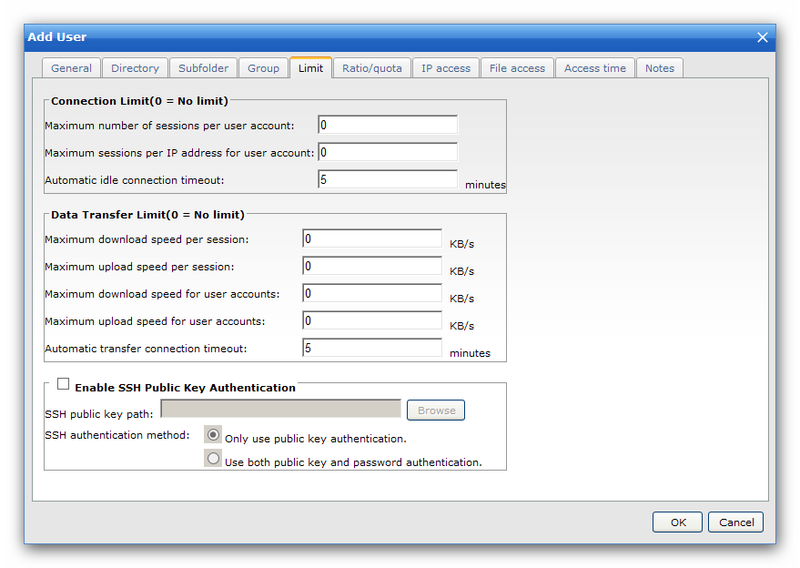 Limits the maximum upload bandwidth for each individual session. Setting a limit of 0 KB/s means unlimited bandwidth. Limits the maximum download bandwidth shared between all sessions associated with an individual user account. Setting a limit of 0 KB/s means unlimited bandwidth. Limits the maximum upload bandwidth shared between all sessions associated with an individual User account. Setting a limit of 0 KB/s means unlimited bandwidth. WingFTP use the password for the SFTP authentication by default. If you want more secure, you can choose use public key authenticate.